In the second part of the winter Art Show ’13 the journal Russian Art & Paris presents four artists to our readers. 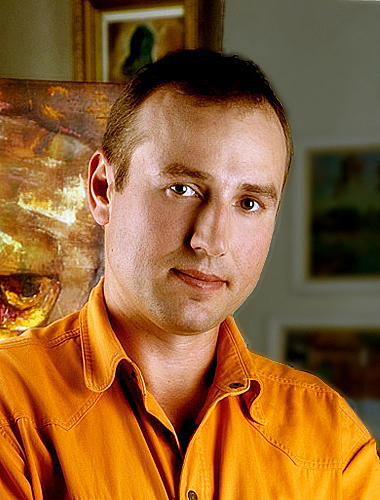 The youngest of them, Eugene Yachny (Saint Petersburg), is just beginning his carrier of professional artist. All others are well known masters in the world of fine art, with a great creative scope and wide range of genres: the Moscow muralist Elena Tupikina, and painters – Yuri Platonov (Gomel) and Vladimir Shichkov (Puchezh). A colorful symphony is a rare phenomenon in modern visual art. Most artists are content to create beautiful melodies and do not try to develop an already good color theme to the scale of an artistic visual symphony. The solution of this type of problem requires a special kind of talent, and a tremendous amount of work. Add to that a high level of artistic cultural, a quality that at present is quite exotic. Nevertheless, interest towards this form of color constructions never dies out. 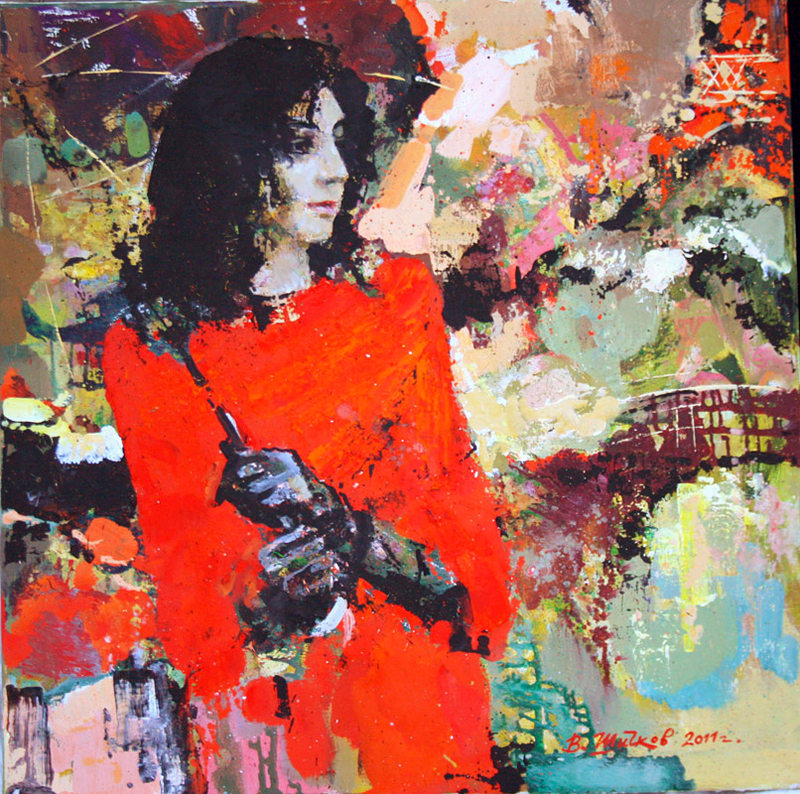 Symphonic understanding of the color harmony is clearly witnessed in many works of the artist Yuri Platonov. Platonov’s scenes are quite traditional, but much less traditional are their color constructions. Let us dwell a little more on this feature of the paintings. • Since the time of the Impressionists, the main form of landscape painting in visual art is considered to be the landscape-natural state. This landscape is familiar to the eye foremost by its similarity with the visual experience of the viewer. 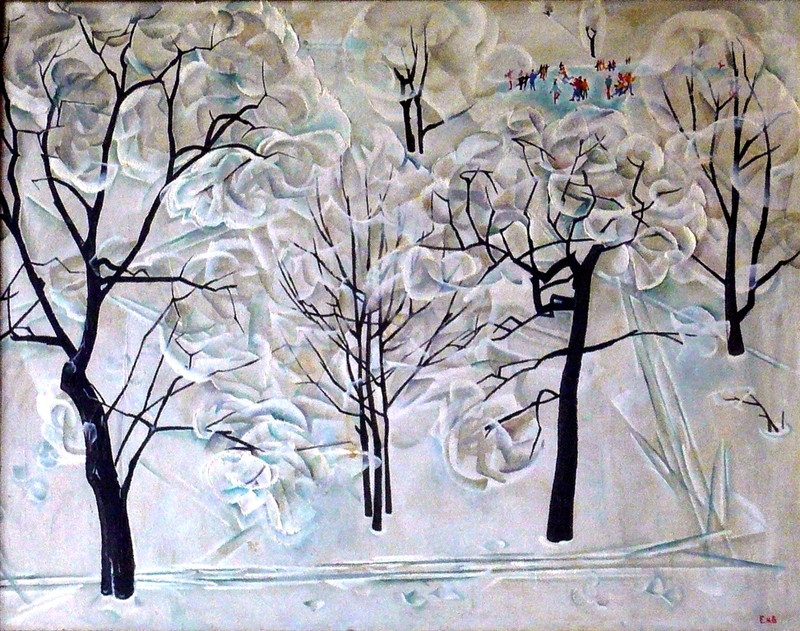 That the result is a portrayal of not so much nature, as simply the weather, does not bother anyone. Even in the real world, we see nature only in combination with certain weather condition. In this fairly coherent and logical landscape painting concept, there is only one weak point – it contains no place for man. The human poorly integrates into the physical series of natural objects. In addition, wherever a man appears, everything nearby becomes his environment. This environment is a landscape too, but not a landscape-natural state, it is a landscape-event. 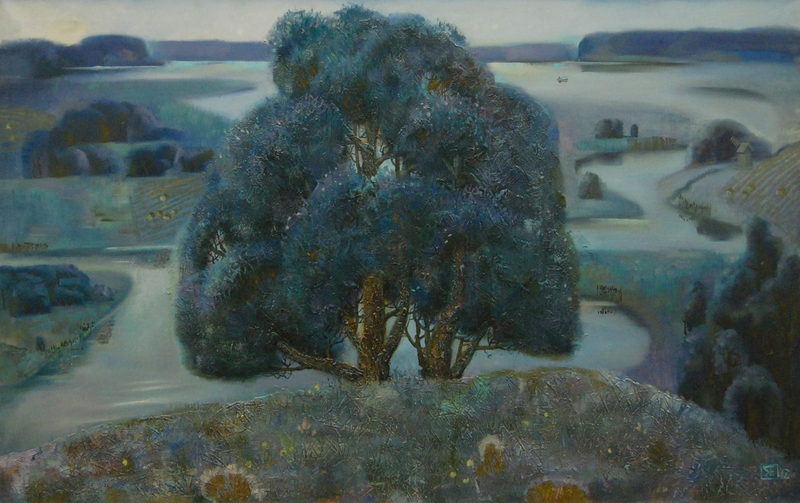 • The landscape of artist Yuri Platonov is a place where man comes into contact with the reality that surrounds him. The state also plays a major role, but the state is not of nature but of man. The recording of the human condition, or, more precisely, the state of the human soul is the traditional task for music. Solving such tasks in painting is not easy, it is essential to create a descriptive row, one that is more sensual than visual. A new representational system, for which the dominant is color itself. The color harmony in such art constructions becomes the functional basis of the work. The color scheme can lose its visual reality, meanwhile acquiring an almost musical quality – a rich complexity of sound, emotion and psychology. 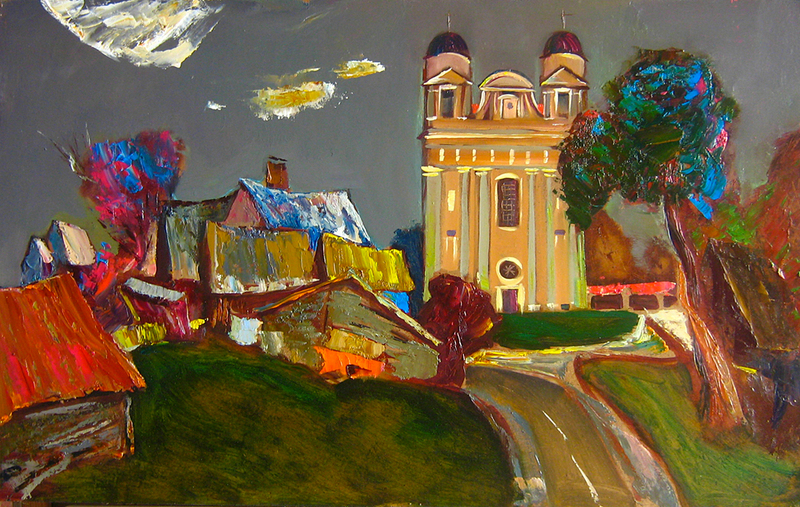 • Artwork “Church of St. Tadeusz on Luchaiy” is in many ways a remarkable work. Colossal color intensity is achieved without an apparent forcing of each individual color. The harmony of the tonal and color systems is gorgeous. The color accents are temperamental, sudden and sharp. The integrity, collectedness of the entire visual row, his “focus” are evidence of a clear understanding by the artist of the meaning of the work for which he approached the canvas. Thinking about the aesthetics of Vladimir Shichkov, noting how precisely the color chords of his works are composed, the term “poetry” involuntarily comes to mind. Concepts, which are used in the theory of poetry seem to be quite adequate for the artistic analysis of the pictorial composition of this master. Rhyme is a measured pace, the rhythm of sound. This definition is most relevant to the creative work of Vladimir Shichkov. 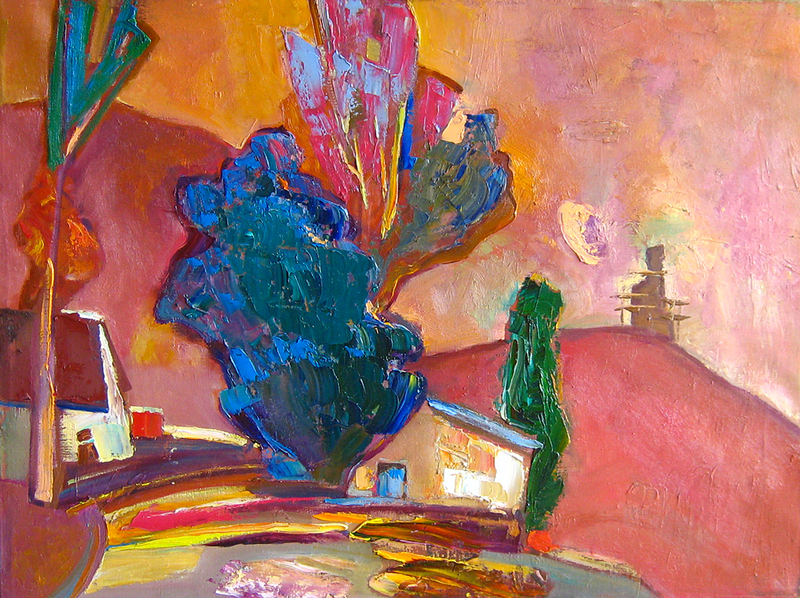 The rhyme of color is at the foundation of his amazing and exceptionally attractive artworks. • Let’s look at a little artistic miracle – “The Indian Summer”. Or at the no less charming – “The Flare” and “The Morning”. What is special about these compositions, which at first glance have quite ordinary plots? Is the innovative character of the artwork? Sure. Excellent color scheme? Absolutely. But apart from these purely artistic aspects, there is another dimension that is absolutely humanitarian – humanity. 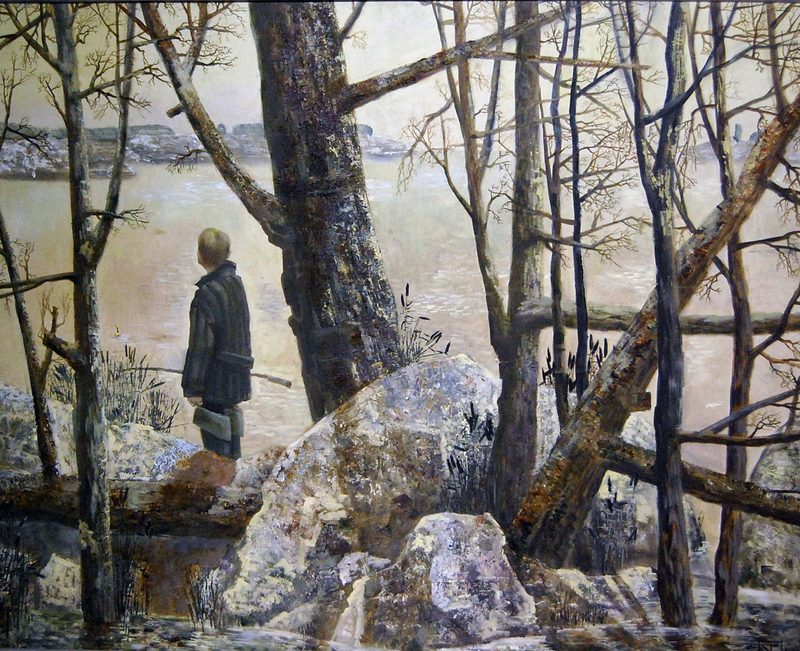 Peering into the coloring of paintings by artist Vladimir Shichkov, listening to the monologue of his paintings, the conclusion has to do quite unexpected. These bright, juicy, and externally flashy pictures lead their conversation with the audience in a surprisingly calm and warm voice. What gives them such a sound? First of all – the rhythm, the movement of the main color harmonies in the plane of the visual field. 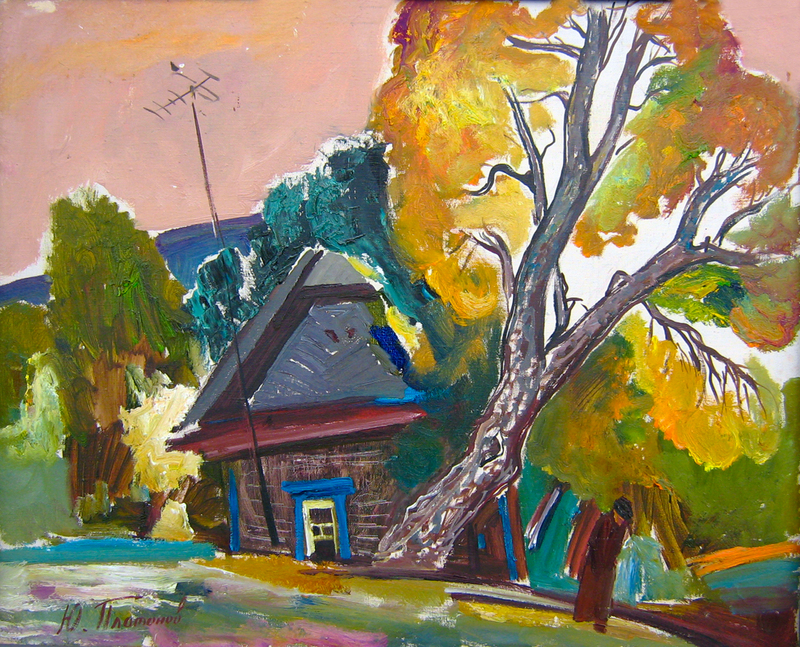 In the brilliant landscape “The Indian Summer” this can be seen most clearly. The rhythm of the main color masses with perfect precision builds the theme of the works – the warm calm of a clear autumn day. 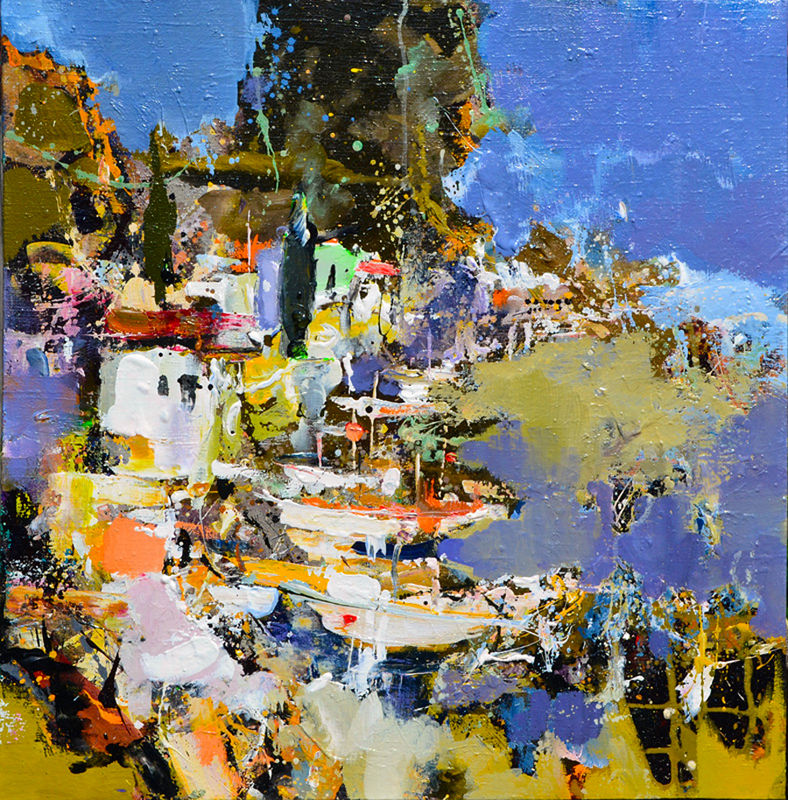 • Much more complex in its compositional and rhythmic construction is the landscape “The Coast”. With a high level of color intensity and strong contrasts, it still retains, however, a sense of comfort of human presence. The rhythm within it is set by the mass of blue color, penetrating the whole composition, and effectively “soothing” the fractional, ringing rhythm of light accents. Rhythm, so to speak, regulates the timbre of the artistic voice – somewhat quiet, somewhat emotional, but never rising to a scream. 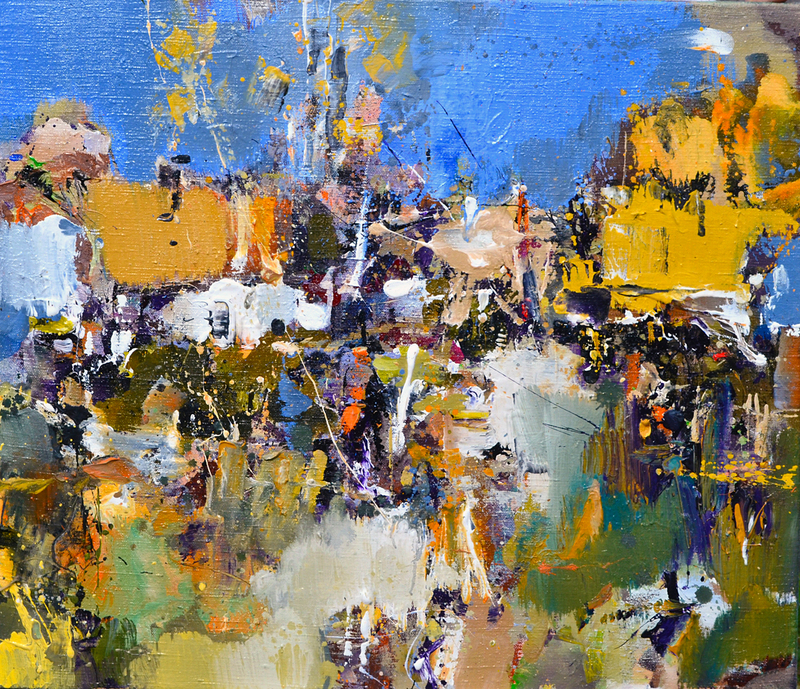 • The subtle understanding of plot in the figurative compositions by Vladimir Shichkov (“Paris”, “Premier”, “Nocturne”, “Giselle”) is present despite the artist favoring a close-up view. This is a remarkable quality. 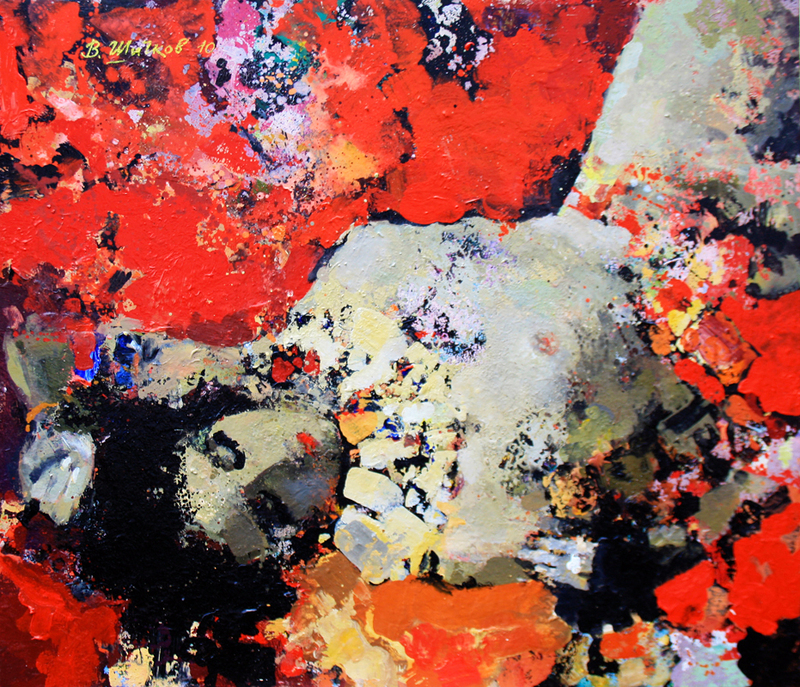 A close-up view, the rise of an image of human body to the very boundary of a canvas, complicates the plot possibilities of the composition. Of all the active tools, the only one left at the disposal of the artist is, perhaps, the gesture. The gesture is understood as a meaningful movement of the entire human body. Could a gesture become the plot of an artwork? The composition “Paris” answers this question quite vividly. The concept of a “modern artist”, presented in an unfolded way is likely to take several full pages, with numerous caveats, footnotes and references to authoritative sources. And even still, it will almost certainly remain quite vague. Maybe it is not worth to look for a definition of this phrase, which mockingly rejects formal logic? Oh, if only … If only the problem of the present, and its derivative – the modern artist, did not stand in the visual arts so acutely! The thing is that the audience is not interested in an artist who does not comprehend the world in which the viewer lives. The event-space, our life, is recognized (or not recognized) by the viewer in the work of any artist, on an intuitive level. Deceive him is impossible, a non-modern audience cannot exist. 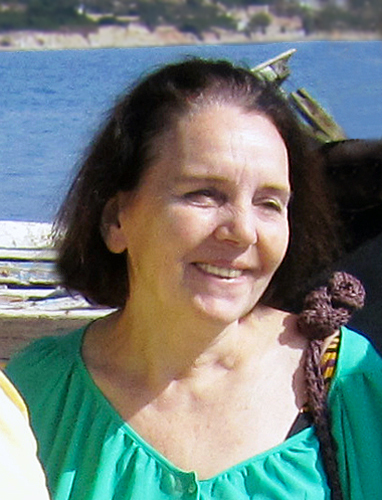 • The world in which artist Elena Tupikina lives and works is well known to the viewer. It’s huge. Where that world’s real existence ends, it’s virtual existence begins and the modern human can easily move from one to another. The vastness of our world has been felt before, but with the advent of the Internet, something new was added – the wide-openness of this world, its disclosure to each of us. We no longer feel like a grain of sand in an infinite space. This space has been mastered – it has become part of our life, our common home. Are you already looking at the portrait “Sasha”? Let’s look at this excellent piece of art together. This is a extremely interesting portrait. This is a portrait of our contemporary. 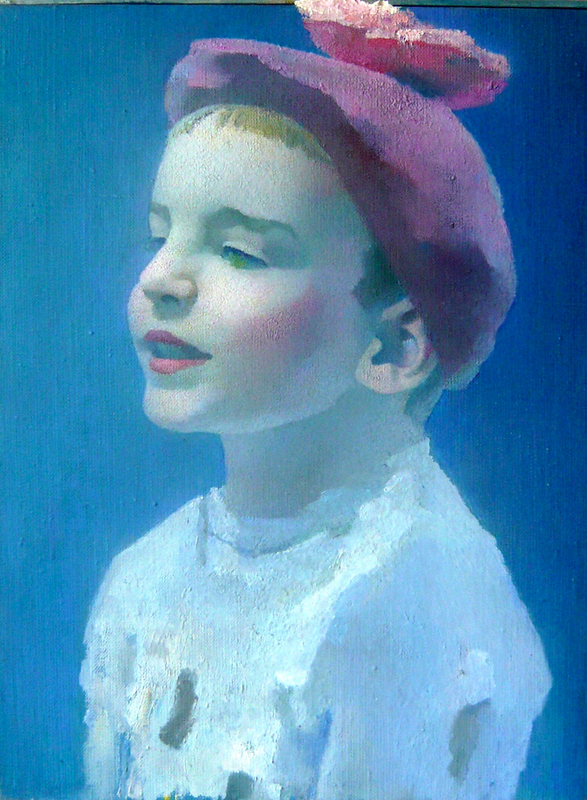 There has never been such a portrait of a child in the realistic visual art. 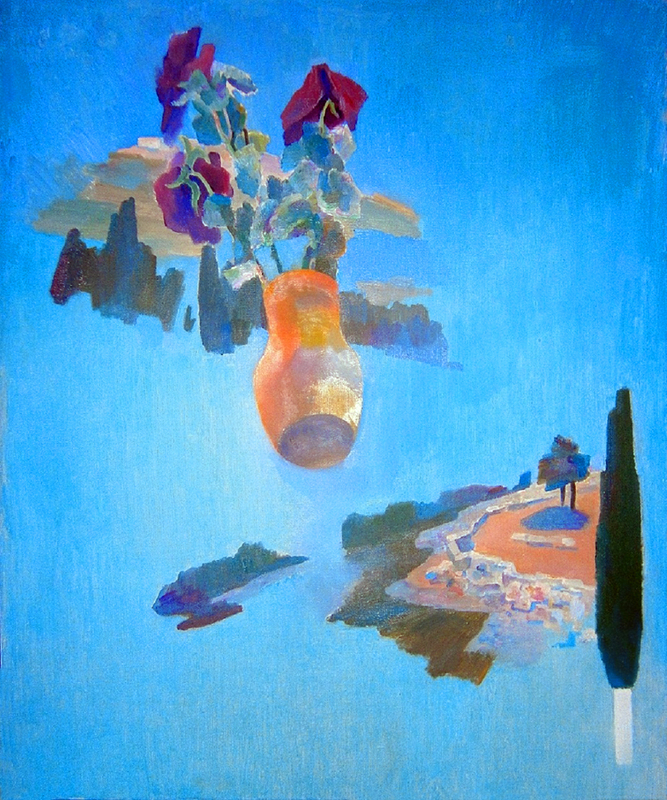 • The compositional space of Elena Tupikina diverges beyond the plane of the painting. The artist only points our attention to a small fragment of a larger, remaining mostly “behind the scenes” image. 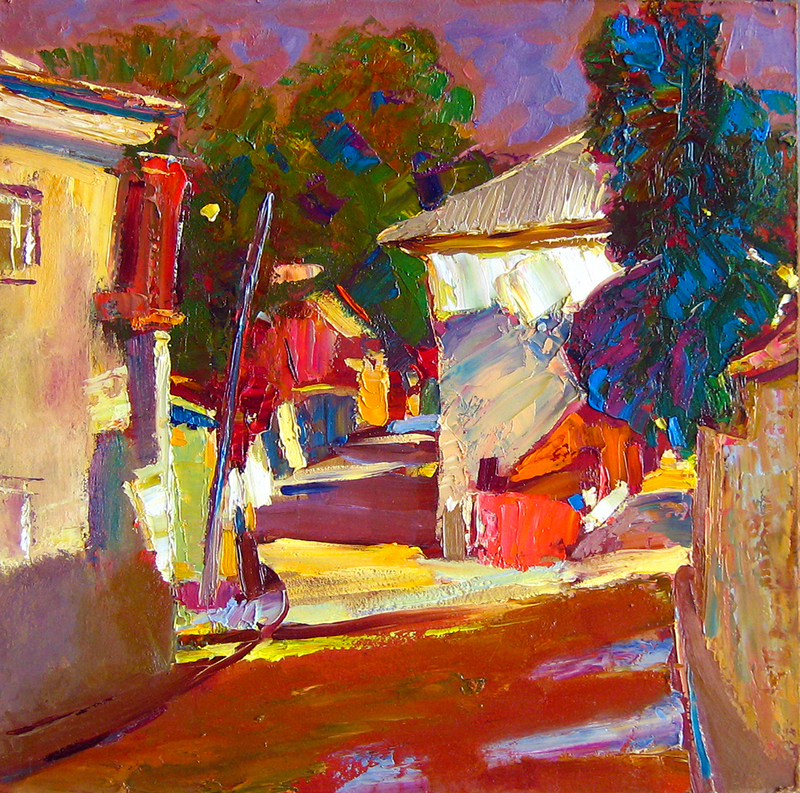 The constant presence of the surrounding world in each composition of artist Elena Tupikina is tangible and not unintentional. The reason, first of all, is that the artist sees this world. Sees it clearly, distinctly and holistically. Particularly, a clear vision underlies the comprehension of themes and plot. Maybe from here comes the unusual, almost antique detachment of the images created by the artist from the artist herself. Such detachment is always speaks about the presence of artistic ideas, and not an impulsive reflection of the observed. Modern writers are actively discussing what awaits the novel form of literature in the near future. Life is good for them! The artists do not argue about the figurative genre of fine art. Not arguing about anything. 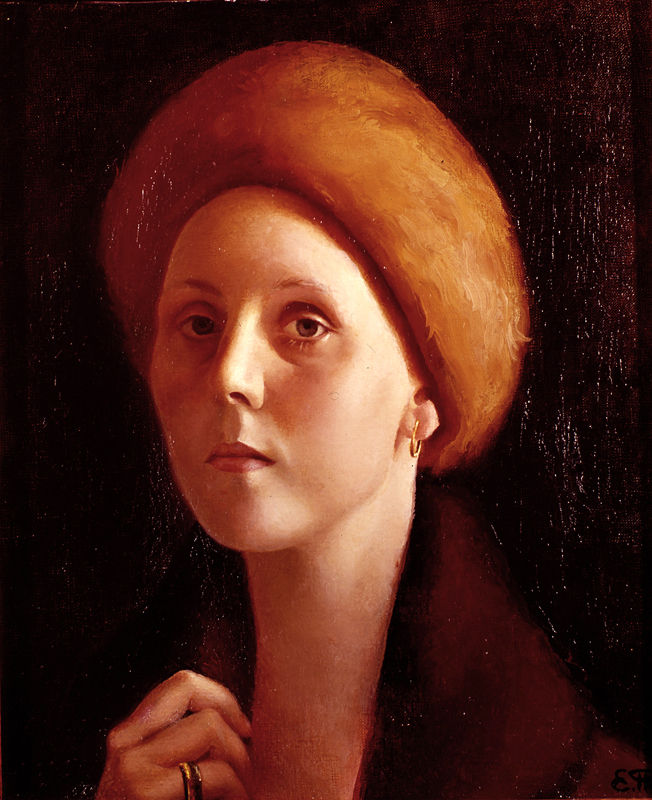 The figurative genre painting in halls of modern galleries and salons is virtually nonexistent. Repeating conversations that the “Genre painting” is out of date does not make sense.The genre will expire no sooner than life itself. The problem is not in the arguments of the debate. The problem is in the artists. If a person does not “see” that his world is filled with human beings, it is natural to ask the simple question – what does he see at all? And why call yourself an artist? The painting “Family”, by artist Eugene Yachny. Open space. A man and a woman. A dialogue of silhouettes, a dialogue of gestures, a dialogue of costumes. A lake and clouds. The ordinary lives of ordinary people, but if you’re an artist, there never was and never will be in our world a more interesting plot than this – a man and a woman … a lake and clouds. 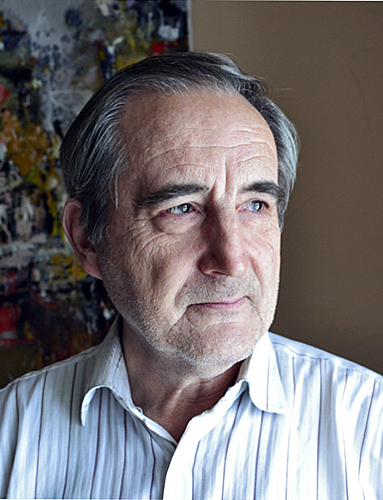 • The name of artist Eugene Yachny is not widely known in the world of fine art. 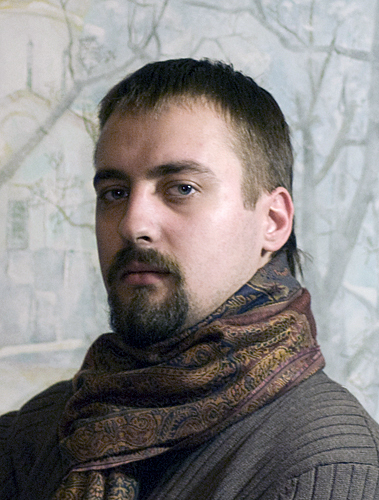 A young Saint Petersburg painter: the first pictures, the first exhibitions, the first audience. The creative work of Eugene Yachny is remarkable because in it can be seen an artist of the genre painting. 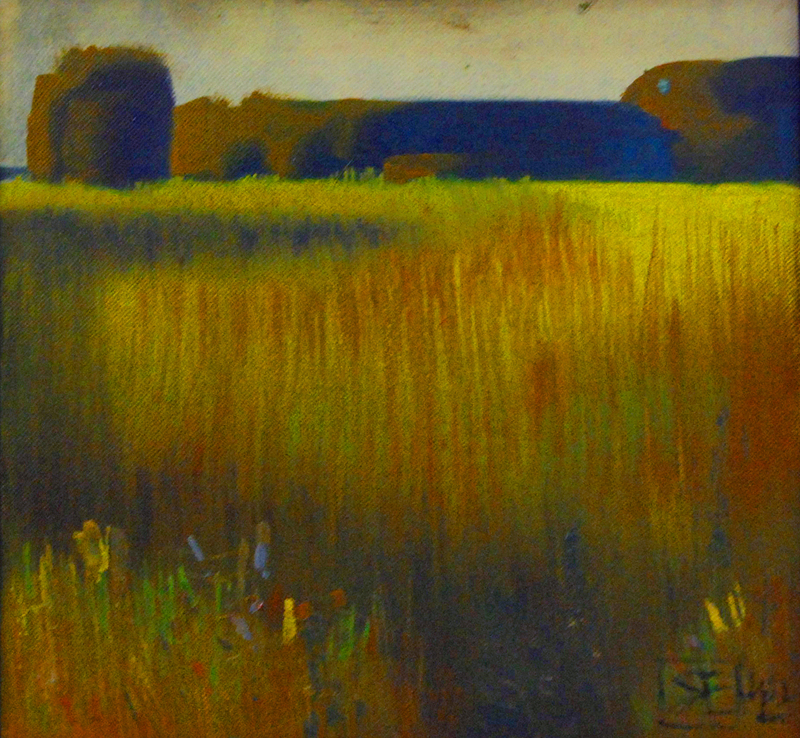 This is not just about figurative genre artworks, but also works in landscape. “Old House”, “The Night Tale”, “Silent” are landscape compositions with noticeable features of the genre painting approach to landscape plot. “Twelve Apostles” is a landscape-monologue. “Emerald Night” is a landscape-contemplation. Perhaps only “The Blue Shadow” is a artwork, very interesting in the coloristic decision, that you can really call a landscape in the traditional sense of the word. The artist’s attitude to the outside world, as if towards inspired living matter, is very appealing. Whether this quality will be preserved in the future cannot be predicted, but currently it exists. 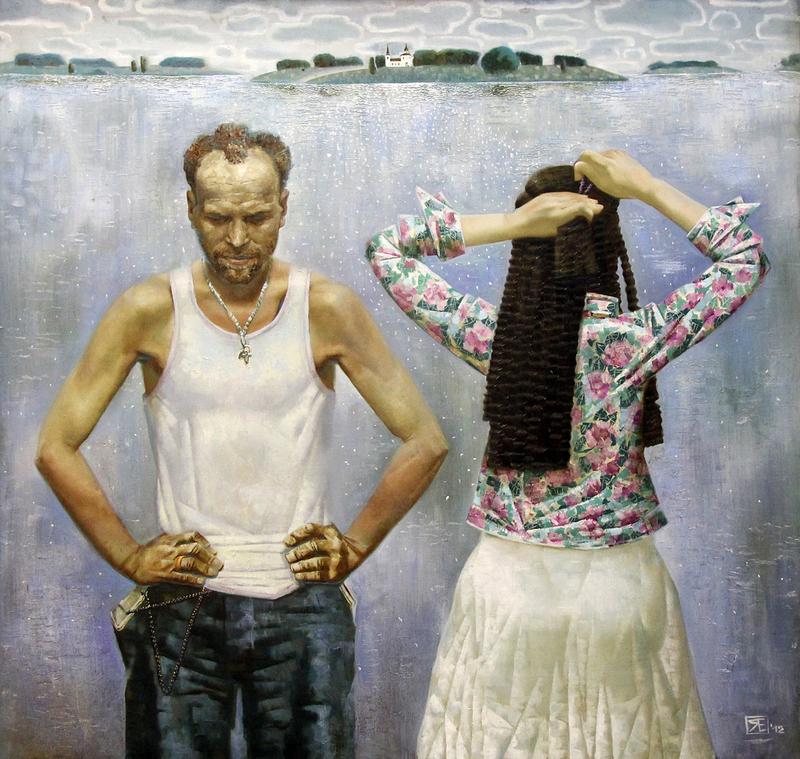 “The Float” is an excellent, modern-sounding figurative genre painting. Genre painting by its subject, plot, and compositional decision. The expressive silhouette of a teenager, the expressive rhythm of an open outdoor space. And, perhaps most importantly – the open look of the artist at the surrounding world, the knowledge that this world exists. Our next publication – “Art Expo New York 2013″ – will be online on Monday, April 1st.